Although health care initially did not belong to the main tasks of the brothers, they started outpatient clinics in some places, because there was a great need for it. The care for elderly and sick fellow brothers is also an important aspect of the lives of the brothers. In 1983, the brothers opened a new noviciate in Oyugis, Kenya, for the religious formation of young African brothers. One of the tasks of these young brothers was the care of patients in a local clinic. This work of mercy became increasingly demanding with the rapid spread of AIDS in the 1980s. The brothers realized that the work could not be limited to care for the sick only, and therefore they started the Oyugis Integrated Project (OIP) in 1996, which seeks an integrated approach. In this sense, this project is not only about health care, because it includes much more than that: care of orphans, education, agricultural projects and social work. 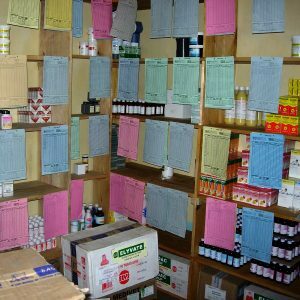 OIP has set up a pharmacy in Oyugis, where local people can go for consultation twice a week. At the pharmacy, small tests can be carried out, blood can be tested and simple medical care is provided. In addition, in recent years OIP has established a strong home care program, involving around 150 volunteers. They provide help to many families in Oyugis. The home care providers have weekly consultations with a nurse and receive further education in various areas. Regarding the medication to control AIDS, there is good cooperation with ‘Doctors Without Boarders’ and local hospitals. 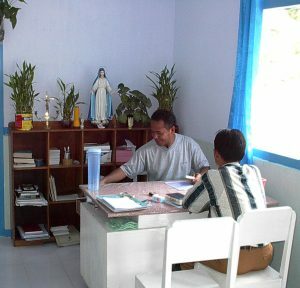 In Indonesia, the brothers opened two policlinics in the 1990s: in Aek Tolang and Ge’tengan. Up to that time, local people depended on medical care at outpatient clinics or hospitals much further away, which were not always open. Some Indonesian brothers followed a medical training and gained experience in government hospitals. With their knowledge and experience, the policlinics could be set up. The brothers, who work together with others in the policlinics in Aek Tolang and Ge’tengan, provide medical care for the local people, and they do so with an attitude of mercy: if someone calls on them outside opening hours, there is always someone to open the door. We express the love which reigns among us in a special way by concerned care for our sick, aged and less able-bodied fellow brothers (Const. I, 91). The specific mission of mercy greatly depends on the context in which a province or region is located. The situation in countries like the Netherlands and Belgium clearly differs from those areas where there are still young brothers. 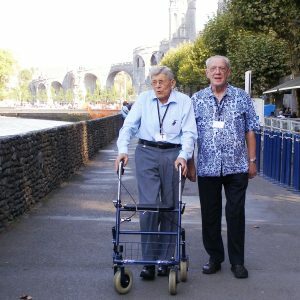 In addition to professional care, the communities Joannes Zwijsen in Tilburg and Het Dorpvelt in Zonhoven are blessed with dedicated volunteers, among whom also fellow brothers. It may seem like it is something small, but they are indispensable for the good functioning of the community, and they contribute to the welfare of fellow brothers who rely on their help. In the community of Joannes Zwijsen there is also a number of associated members who are very much involved. In the congregation, especially in the Dutch communities, the associated members play an important role in the realization of the mission.